There are over 80,000 beauty establishments for customers to choose from when it comes to a new haircut or a manicure. This means that your salon’s success depends not only on its technical skills and creativity but also your ability to reach (and retain) new customers. Personal recommendations and online reviews rule. When it comes to finding a new salon, personal recommendations are key. Nearly two-thirds of people said they are most likely to ask friends and family for a recommendation, and a personal recommendation is important to some degree for 92 percent of people surveyed. The second-most preferred method of finding a salon is through online reviews posted by customers. 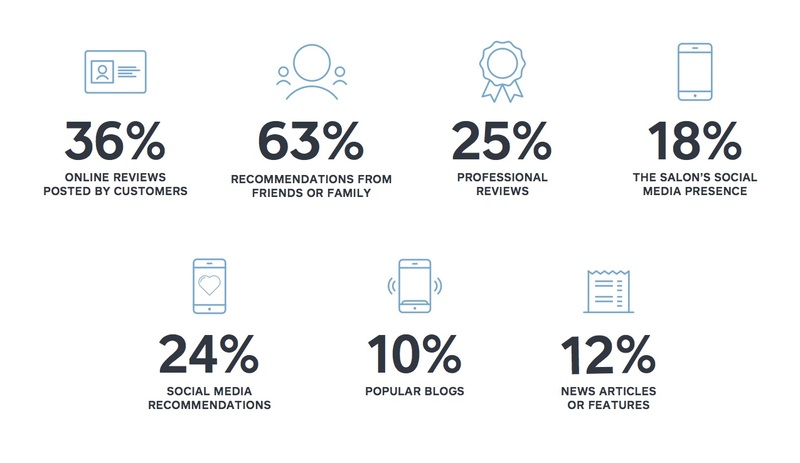 Interestingly, nearly half of the people surveyed said they trust other customers’ reviews more than they trust reviews written by professionals. The content of those reviews is important, too. Seventy-seven percent of people said it’s very or extremely important that a reliable review includes specific details about the products or services someone has purchased. When you are looking for a salon to try, which of the following are you likely to seek out? Reviews aren’t from where you’d think. The biggest group of consumers (28 percent) said that Google Reviews is their favorite source for online reviews. Google Reviews are built into the online discovery process, which could explain this preference. Whenever consumers perform a search on Google, they see Google Reviews. If a consumer wants to find the best ladies’ salon in the city, for example, and googles it, the first thing that comes up at the top of the results page is a list of local salons with star ratings from customers. After Google Reviews, the next favorite online review sites are Facebook and Yelp. And consumers are checking these online platforms regularly for recommendations — over 20 percent reported looking up reviews on a website or app a few times per week, while almost a quarter reported checking a few times per month. About how often — if ever — do you look up reviews on a website or app? Facebook is the favorite social media platform for finding salons. Almost 75 percent of consumers said Facebook is their favorite social platform to find salons. Behind Facebook is Instagram, then Snapchat, and Twitter. Additionally, 50 percent of people overall have become interested in a salon after seeing a picture someone posted on Facebook or Instagram — this goes up even higher for younger generations like millennials and Xennials. People use social media proactively to discover salons. Consumers aren’t just scrolling through social media and coming across salons. Some are proactively asking their networks for recommendations (Facebook even has a special feature for this now). A third of people have posted to social media to ask for a salon recommendation. Here’s how to put this data into action at your own salon, to ensure you’ll have new customers coming through the door. Consumers trust their peers, so online reviews are important to drawing in new customers. The more reviews available, the more information potential clients have about your business, your products, and your services. To ensure a strong presence, stay active on review sites. Respond to reviews, whether they’re positive or negative. It’s important to let customers know they are heard, and that you genuinely appreciate them taking the time to sing your praises or show you how to improve. Learn more about how to harness the power of customer reviews with this webinar we hosted with Yelp. How are you doing? When customers know that you take their feedback seriously, they know you care. Set out written feedback cards, or implement a POS that requests feedback from your customers. You might also ask your employees to informally let you know of any feedback that customers have. The happier your customers are, and the more responsive you are to feedback, the more likely you are to have customers singing your praises to their friends and family. Have a solid social media presence. Building your brand on social media is an important aspect of marketing, especially when it comes to hair styling and beauty. Create a strong presence online, and ensure that you (and/or your employees) update it regularly. To help you get started, you can find advice for building your brand on social media from Square’s expert, learn our favorite tips for Instagram for salons, and discover how to get creative with Stories and live video.